Ebner et al. report that TTP regulates the timing of apoptosis in activated neutrophils via destabilization of the mRNA for the anti-apoptotic protein MCL-1. 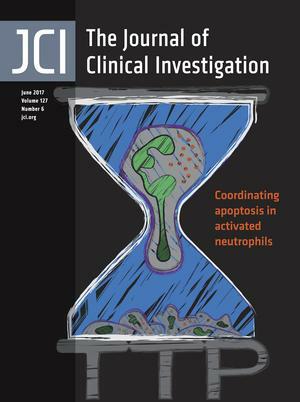 The cover image evokes the ephemeral nature of neutrophil engagement, depicting a neutrophil melting through an hourglass as it undergoes TTP-regulated apoptosis. Image credit: Florian Ebner. Citation Information: J Clin Invest. 2017;127(6):2022-2029. https://doi.org/10.1172/JCI93537. Inflammasomes are high-molecular-weight cytosolic complexes that mediate the activation of caspases. There are many inflammasomes, and each is influenced by a unique pattern-recognition receptor response. Two signals are typically involved in the inflammasome pathways. Signal one involves recognition of pathogen-associated molecular patterns (PAMPs), such as LPS or other colonizing/invading microbes, that interact with TLRs, which induce the downstream production of pro–IL-1β. This is followed by signal two, which involves recognition of PAMPs or damage-associated molecular patterns (DAMPs), such as uric acid or ATP, via NLRP3, which leads to caspase-1–dependent cleavage of pro–IL-1β to active IL-1β and pyroptosis. Ultimately, these two signals cause the release of multiple proinflammatory cytokines. Both PAMPs and DAMPs can be liberated by early insults to the allograft, including ischemia/reperfusion injury, infections, and rejection. The consequence of inflammasome activation and IL-1 expression is the upregulation of adhesion molecules and chemokines, which leads to allograft neutrophil sequestration, mononuclear phagocyte recruitment, and T cell activation, all of which are key steps in the continuum from allograft insult to chronic allograft dysfunction. Citation Information: J Clin Invest. 2017;127(6):2030-2039. https://doi.org/10.1172/JCI93356. There are many causes of inflammatory osteolysis, but regardless of etiology and cellular contexts, the osteoclast is the bone-degrading cell. Thus, the impact of inflammatory cytokines on osteoclast formation and function was among the most important discoveries advancing the treatment of focal osteolysis, leading to development of therapeutic agents that either directly block the bone-resorptive cell or do so indirectly via cytokine arrest. Despite these advances, a substantial number of patients with inflammatory arthritis remain resistant to current therapies, and even effective anti-inflammatory drugs frequently do not repair damaged bone. Thus, insights into events such as those impacted by inflammasomes, which signal through cytokine-dependent and -independent mechanisms, are needed to optimize treatment of inflammatory osteolysis. Citation Information: J Clin Invest. 2017;127(6):2040-2043. https://doi.org/10.1172/JCI94494. Diabetes mellitus is associated with an increased risk for cardiovascular disease, but the link between hyperglycemia and atherothrombotic disease is not completely understood. Patients with diabetes often show hyporesponsiveness to antiplatelet therapies, and it has been suggested that hyperreactive reticulated platelets underlie this altered therapeutic response. In this issue of the JCI, Kraakman et al. uncover a previously unknown link between hyperglycemia and enhanced platelet production and reactivity. The authors demonstrate that high blood glucose levels trigger neutrophil release of S100 calcium-binding protein A8/A9 (S100A8/A9), which binds to the receptor for advanced glycation end products (RAGE) on Kupffer cells, ultimately leading to increased thrombopoietin (TPO) production in the liver. TPO causes megakaryocyte proliferation and increased platelet production. This study demonstrates the importance of glycemic control and identifies potential therapeutic targets in the normalization of platelet numbers and function in diabetes. Citation Information: J Clin Invest. 2017;127(6):2048-2050. https://doi.org/10.1172/JCI94763. Observed deficits in protein phosphatase 2A (PP2A) function in a variety of human cancers have stimulated drug discovery efforts aimed at restoring PP2A function to inhibit tumor growth. Work published by Sangodkar et al. in this issue of the JCI describes the characterization of orally available small molecule activators of PP2A (SMAPs). These SMAPs attenuated mitogenic signaling and triggered apoptosis in KRAS-mutant lung cancer cells and inhibited tumor growth in murine models. Tumors with mutations in the SMAP-binding site of the PP2A A subunit displayed resistance to SMAPs. Future studies that identify the PP2A-regulated events targeted by SMAPs should guide critical decisions about which cancers might be best treated with these molecules. This study provides encouraging evidence in favor of SMAPs as potential anticancer drugs. Citation Information: J Clin Invest. 2017;127(6):2051-2065. https://doi.org/10.1172/JCI80631. Protective responses against pathogens require a rapid mobilization of resting neutrophils and the timely removal of activated ones. Neutrophils are exceptionally short-lived leukocytes, yet it remains unclear whether the lifespan of pathogen-engaged neutrophils is regulated differently from that in the circulating steady-state pool. Here, we have found that under homeostatic conditions, the mRNA-destabilizing protein tristetraprolin (TTP) regulates apoptosis and the numbers of activated infiltrating murine neutrophils but not neutrophil cellularity. Activated TTP-deficient neutrophils exhibited decreased apoptosis and enhanced accumulation at the infection site. In the context of myeloid-specific deletion of Ttp, the potentiation of neutrophil deployment protected mice against lethal soft tissue infection with Streptococcus pyogenes and prevented bacterial dissemination. Neutrophil transcriptome analysis revealed that decreased apoptosis of TTP-deficient neutrophils was specifically associated with elevated expression of myeloid cell leukemia 1 (Mcl1) but not other antiapoptotic B cell leukemia/lymphoma 2 (Bcl2) family members. Higher Mcl1 expression resulted from stabilization of Mcl1 mRNA in the absence of TTP. The low apoptosis rate of infiltrating TTP-deficient neutrophils was comparable to that of transgenic Mcl1-overexpressing neutrophils. Our study demonstrates that posttranscriptional gene regulation by TTP schedules the termination of the antimicrobial engagement of neutrophils. The balancing role of TTP comes at the cost of an increased risk of bacterial infections. Citation Information: J Clin Invest. 2017;127(6):2066-2080. https://doi.org/10.1172/JCI83936. Primary effusion lymphoma (PEL) is a largely incurable malignancy of B cell origin with plasmacytic differentiation. Here, we report the identification of a highly effective inhibitor of PEL. This compound, 6-ethylthioinosine (6-ETI), is a nucleoside analog with toxicity to PEL in vitro and in vivo, but not to other lymphoma cell lines tested. We developed and performed resistome analysis, an unbiased approach based on RNA sequencing of resistant subclones, to discover the molecular mechanisms of sensitivity. We found different adenosine kinase–inactivating (ADK-inactivating) alterations in all resistant clones and determined that ADK is required to phosphorylate and activate 6-ETI. Further, we observed that 6-ETI induces ATP depletion and cell death accompanied by S phase arrest and DNA damage only in ADK-expressing cells. Immunohistochemistry for ADK served as a biomarker approach to identify 6-ETI–sensitive tumors, which we documented for other lymphoid malignancies with plasmacytic features. Notably, multiple myeloma (MM) expresses high levels of ADK, and 6-ETI was toxic to MM cell lines and primary specimens and had a robust antitumor effect in a disseminated MM mouse model. Several nucleoside analogs are effective in treating leukemias and T cell lymphomas, and 6-ETI may fill this niche for the treatment of PEL, plasmablastic lymphoma, MM, and other ADK-expressing cancers. Citation Information: J Clin Invest. 2017;127(6):2081-2090. https://doi.org/10.1172/JCI89548. Targeted cancer therapies, which act on specific cancer-associated molecular targets, are predominantly inhibitors of oncogenic kinases. While these drugs have achieved some clinical success, the inactivation of kinase signaling via stimulation of endogenous phosphatases has received minimal attention as an alternative targeted approach. Here, we have demonstrated that activation of the tumor suppressor protein phosphatase 2A (PP2A), a negative regulator of multiple oncogenic signaling proteins, is a promising therapeutic approach for the treatment of cancers. Our group previously developed a series of orally bioavailable small molecule activators of PP2A, termed SMAPs. We now report that SMAP treatment inhibited the growth of KRAS-mutant lung cancers in mouse xenografts and transgenic models. Mechanistically, we found that SMAPs act by binding to the PP2A Aα scaffold subunit to drive conformational changes in PP2A. These results show that PP2A can be activated in cancer cells to inhibit proliferation. Our strategy of reactivating endogenous PP2A may be applicable to the treatment of other diseases and represents an advancement toward the development of small molecule activators of tumor suppressor proteins. Citation Information: J Clin Invest. 2017;127(6):2091-2105. https://doi.org/10.1172/JCI89914. Tumor recurrence is the leading cause of breast cancer–related death. Recurrences are largely driven by cancer cells that survive therapeutic intervention. This poorly understood population is referred to as minimal residual disease. Here, using mouse models that faithfully recapitulate human disease together with organoid cultures, we have demonstrated that residual cells acquire a transcriptionally distinct state from normal epithelium and primary tumors. Gene expression changes and functional characterization revealed altered lipid metabolism and elevated ROS as hallmarks of the cells that survive tumor regression. These residual cells exhibited increased oxidative DNA damage, potentiating the acquisition of somatic mutations during hormonal-induced expansion of the mammary cell population. Inhibition of either cellular fatty acid synthesis or fatty acid transport into mitochondria reduced cellular ROS levels and DNA damage, linking these features to lipid metabolism. Direct perturbation of these hallmarks in vivo, either by scavenging ROS or by halting the cyclic mammary cell population expansion, attenuated tumor recurrence. Finally, these observations were mirrored in transcriptomic and histological signatures of residual cancer cells from neoadjuvant-treated breast cancer patients. These results highlight the potential of lipid metabolism and ROS as therapeutic targets for reducing tumor recurrence in breast cancer patients. Citation Information: J Clin Invest. 2017;127(6):2106-2117. https://doi.org/10.1172/JCI90281. Citation Information: J Clin Invest. 2017;127(6):2118-2132. https://doi.org/10.1172/JCI92001. Approximately 30% of epilepsy patients do not respond to antiepileptic drugs, representing an unmet medical need. There is evidence that neuroinflammation plays a pathogenic role in drug-resistant epilepsy. The high-mobility group box 1 (HMGB1)/TLR4 axis is a key initiator of neuroinflammation following epileptogenic injuries, and its activation contributes to seizure generation in animal models. However, further work is required to understand the role of HMGB1 and its isoforms in epileptogenesis and drug resistance. Using a combination of animal models and sera from clinically well-characterized patients, we have demonstrated that there are dynamic changes in HMGB1 isoforms in the brain and blood of animals undergoing epileptogenesis. The pathologic disulfide HMGB1 isoform progressively increased in blood before epilepsy onset and prospectively identified animals that developed the disease. Consistent with animal data, we observed early expression of disulfide HMGB1 in patients with newly diagnosed epilepsy, and its persistence was associated with subsequent seizures. In contrast with patients with well-controlled epilepsy, patients with chronic, drug-refractory epilepsy persistently expressed the acetylated, disulfide HMGB1 isoforms. Moreover, treatment of animals with antiinflammatory drugs during epileptogenesis prevented both disease progression and blood increase in HMGB1 isoforms. Our data suggest that HMGB1 isoforms are mechanistic biomarkers for epileptogenesis and drug-resistant epilepsy in humans, necessitating evaluation in larger-scale prospective studies. Citation Information: J Clin Invest. 2017;127(6):2133-2147. https://doi.org/10.1172/JCI92450. Platelets play a critical role in atherogenesis and thrombosis-mediated myocardial ischemia, processes that are accelerated in diabetes. Whether hyperglycemia promotes platelet production and whether enhanced platelet production contributes to enhanced atherothrombosis remains unknown. Here we found that in response to hyperglycemia, neutrophil-derived S100 calcium-binding proteins A8/A9 (S100A8/A9) interact with the receptor for advanced glycation end products (RAGE) on hepatic Kupffer cells, resulting in increased production of IL-6, a pleiotropic cytokine that is implicated in inflammatory thrombocytosis. IL-6 acts on hepatocytes to enhance the production of thrombopoietin, which in turn interacts with its cognate receptor c-MPL on megakaryocytes and bone marrow progenitor cells to promote their expansion and proliferation, resulting in reticulated thrombocytosis. Lowering blood glucose using a sodium-glucose cotransporter 2 inhibitor (dapagliflozin), depleting neutrophils or Kupffer cells, or inhibiting S100A8/A9 binding to RAGE (using paquinimod), all reduced diabetes-induced thrombocytosis. Inhibiting S100A8/A9 also decreased atherogenesis in diabetic mice. Finally, we found that patients with type 2 diabetes have reticulated thrombocytosis that correlates with glycated hemoglobin as well as increased plasma S100A8/A9 levels. These studies provide insights into the mechanisms that regulate platelet production and may aid in the development of strategies to improve on current antiplatelet therapies and to reduce cardiovascular disease risk in diabetes. Citation Information: J Clin Invest. 2017;127(6):2159-2175. https://doi.org/10.1172/JCI90077. Geminin expression is essential for embryonic development and the maintenance of chromosomal integrity. In spite of this protective role, geminin is also frequently overexpressed in human cancers and the molecular mechanisms underlying its role in tumor progression remain unclear. The histone deacetylase HDAC3 modulates transcription factors to activate or suppress transcription. Little is known about how HDAC3 specifies substrates for modulation among highly homologous transcription factor family members. Here, we have demonstrated that geminin selectively couples the transcription factor forkhead box O3 (FoxO3) to HDAC3, thereby specifically facilitating FoxO3 deacetylation. We determined that geminin–associated HDAC3 deacetylates FoxO3 to block its transcriptional activity, leading to downregulation of the downstream FoxO3 target Dicer, an RNase that suppresses metastasis. Breast cancer cells depleted of geminin or HDAC3 exhibited poor metastatic potential that was attributed to reduced suppression of the FoxO3-Dicer axis. Moreover, elevated levels of geminin, HDAC3, or both together with decreased FoxO3 acetylation and reduced Dicer expression were detected in aggressive human breast cancer specimens. These results underscore a prominent role for geminin in promoting breast cancer metastasis via the enzyme-substrate–coupling mechanism in HDAC3-FoxO3 complex formation. Citation Information: J Clin Invest. 2017;127(6):2176-2191. https://doi.org/10.1172/JCI87624. Therapies using T cells that are programmed to express chimeric antigen receptors (CAR T cells) consistently produce positive results in patients with hematologic malignancies. However, CAR T cell treatments are less effective in solid tumors for several reasons. First, lymphocytes do not efficiently target CAR T cells; second, solid tumors create an immunosuppressive microenvironment that inactivates T cell responses; and third, solid cancers are typified by phenotypic diversity and thus include cells that do not express proteins targeted by the engineered receptors, enabling the formation of escape variants that elude CAR T cell targeting. Here, we have tested implantable biopolymer devices that deliver CAR T cells directly to the surfaces of solid tumors, thereby exposing them to high concentrations of immune cells for a substantial time period. In immunocompetent orthotopic mouse models of pancreatic cancer and melanoma, we found that CAR T cells can migrate from biopolymer scaffolds and eradicate tumors more effectively than does systemic delivery of the same cells. We have also demonstrated that codelivery of stimulator of IFN genes (STING) agonists stimulates immune responses to eliminate tumor cells that are not recognized by the adoptively transferred lymphocytes. Thus, these devices may improve the effectiveness of CAR T cell therapy in solid tumors and help protect against the emergence of escape variants. Citation Information: J Clin Invest. 2017;127(6):2192-2205. https://doi.org/10.1172/JCI86282. Inflammatory bowel disease (IBD) is characterized by dysregulation in both cytokines and responses to intestinal microbes, and proper regulation of pattern recognition receptor (PRR) signaling is critical for intestinal immune homeostasis. Altered functions for the IBD risk locus containing rs7554511, which encompasses the C1orf106 gene (recently named INAVA), and roles for the protein encoded by the INAVA gene are unknown. Here, we investigated the role of INAVA and INAVA genotype in regulating PRR-initiated outcomes in primary human cells. Both peripheral and intestinal myeloid cells expressed INAVA. Upon PRR stimulation, INAVA was required for optimal MAPK and NF-κB activation, cytokine secretion, and intracellular bacterial clearance. INAVA recruited 14-3-3τ, thereby contributing to recruitment of a signaling complex that amplified downstream signals and cytokines. Further, INAVA enhanced bacterial clearance by regulating reactive oxygen, reactive nitrogen, and autophagy pathways. Macrophages from rs7554511 C risk carriers expressed lower levels of INAVA RNA and protein. Lower expression was attributed in part to decreased transcription mediated directly by the intronic region containing the rs7554511 C variant. In rs7554511 C risk carrier macrophages, lower INAVA expression led to decreased PRR-induced activation of MAPK and NF-κB pathways, cytokines, and bacterial clearance pathways. Thus, IBD-associated polymorphisms in INAVA modulate PRR-initiated signaling, cytokines, and intracellular bacterial clearance, likely contributing to intestinal immune homeostasis. Citation Information: J Clin Invest. 2017;127(6):2206-2221. https://doi.org/10.1172/JCI91363. Mutations of the splicing factor–encoding gene U2AF1 are frequent in the myelodysplastic syndromes (MDS), a myeloid malignancy, and other cancers. Patients with MDS suffer from peripheral blood cytopenias, including anemia, and an increasing percentage of bone marrow myeloblasts. We studied the impact of the common U2AF1S34F mutation on cellular function and mRNA splicing in the main cell lineages affected in MDS. We demonstrated that U2AF1S34F expression in human hematopoietic progenitors impairs erythroid differentiation and skews granulomonocytic differentiation toward granulocytes. RNA sequencing of erythroid and granulomonocytic colonies revealed that U2AF1S34F induced a higher number of cassette exon splicing events in granulomonocytic cells than in erythroid cells. U2AF1S34F altered mRNA splicing of many transcripts that were expressed in both cell types in a lineage-specific manner. In hematopoietic progenitors, the introduction of isoform changes identified in the U2AF1S34F target genes H2AFY, encoding an H2A histone variant, and STRAP, encoding serine/threonine kinase receptor–associated protein, recapitulated phenotypes associated with U2AF1S34F expression in erythroid and granulomonocytic cells, suggesting a causal link. Furthermore, we showed that isoform modulation of H2AFY and STRAP rescues the erythroid differentiation defect in U2AF1S34F MDS cells, suggesting that splicing modulators could be used therapeutically. These data have critical implications for understanding MDS phenotypic heterogeneity and support the development of therapies targeting splicing abnormalities. Citation Information: J Clin Invest. 2017;127(6):2222-2234. https://doi.org/10.1172/JCI91075. Tissue-resident immune cells play a key role in local and systemic immune responses. The liver, in particular, hosts a large number of invariant natural killer T (iNKT) cells, which are involved in diverse immune responses. However, the mechanisms that regulate survival and homeostasis of liver iNKT cells are poorly defined. Here we have found that liver iNKT cells constitutively express the costimulatory TNF superfamily receptor OX40 and that OX40 stimulation results in massive pyroptotic death of iNKT cells, characterized by the release of potent proinflammatory cytokines that induce liver injury. This OX40/NKT pyroptosis pathway also plays a key role in concanavalin A–induced murine hepatitis. Mechanistically, we demonstrated that liver iNKT cells express high levels of caspase 1 and that OX40 stimulation activates caspase 1 via TNF receptor–associated factor 6–mediated recruitment of the paracaspase MALT1. We also found that activation of caspase 1 in iNKT cells results in processing of pro–IL-1β to mature IL-1β as well as cleavage of the pyroptotic protein gasdermin D, which generates a membrane pore–forming fragment to produce pyroptotic cell death. Thus, our study has identified OX40 as a death receptor for iNKT cells and uncovered a molecular mechanism of pyroptotic cell death. These findings may have important clinical implications in the development of OX40-directed therapies. Citation Information: J Clin Invest. 2017;127(6):2235-2248. https://doi.org/10.1172/JCI88725. Citation Information: J Clin Invest. 2017;127(6):2249-2261. https://doi.org/10.1172/JCI89652. Pseudomonas aeruginosa is a major cause of severe infections that lead to bacteremia and high patient mortality. P. aeruginosa has evolved numerous evasion and subversion mechanisms that work in concert to overcome immune recognition and effector functions in hospitalized and immunosuppressed individuals. Here, we have used multilaser spinning-disk intravital microscopy to monitor the blood-borne stage in a murine bacteremic model of P. aeruginosa infection. P. aeruginosa adhered avidly to lung vasculature, where patrolling neutrophils and other immune cells were virtually blind to the pathogen’s presence. This cloaking phenomenon was attributed to expression of Psl exopolysaccharide. Although an anti-Psl mAb activated complement and enhanced neutrophil recognition of P. aeruginosa, neutrophil-mediated clearance of the pathogen was suboptimal owing to a second subversion mechanism, namely the type 3 secretion (T3S) injectisome. Indeed, T3S prevented phagosome acidification and resisted killing inside these compartments. Antibody-mediated inhibition of the T3S protein PcrV did not enhance bacterial phagocytosis but did enhance killing of the few bacteria ingested by neutrophils. A bispecific mAb targeting both Psl and PcrV enhanced neutrophil uptake of P. aeruginosa and also greatly increased inhibition of T3S function, allowing for phagosome acidification and bacterial killing. These data highlight the need to block multiple evasion and subversion mechanisms in tandem to kill P. aeruginosa. Citation Information: J Clin Invest. 2017;127(6):2262-2276. https://doi.org/10.1172/JCI88629. Citation Information: J Clin Invest. 2017;127(6):2295-2309. https://doi.org/10.1172/JCI91038. Consciousness can be defined by two major attributes: awareness of environment and self, and arousal, which reflects the level of awareness. The return of arousal after general anesthesia presents an experimental tool for probing the neural mechanisms that control consciousness. Here we have identified that systemic or intracerebral injection of the cannabinoid CB1 receptor (CB1R) antagonist AM281 into the dorsomedial nucleus of the hypothalamus (DMH) — but not the adjacent perifornical area (Pef) or the ventrolateral preoptic nucleus of the hypothalamus (VLPO) — accelerates arousal in mice recovering from general anesthesia. Anesthetics selectively activated endocannabinoid (eCB) signaling at DMH glutamatergic but not GABAergic synapses, leading to suppression of both glutamatergic DMH-Pef and GABAergic DMH-VLPO projections. Deletion of CB1R from widespread cerebral cortical or prefrontal cortical (PFC) glutamatergic neurons, including those innervating the DMH, mimicked the arousal-accelerating effects of AM281. In contrast, CB1R deletion from brain GABAergic neurons or hypothalamic glutamatergic neurons did not affect recovery time from anesthesia. Inactivation of PFC-DMH, DMH-VLPO, or DMH-Pef projections blocked AM281-accelerated arousal, whereas activation of these projections mimicked the effects of AM281. We propose that decreased eCB signaling at glutamatergic terminals of the PFC-DMH projection accelerates arousal from general anesthesia through enhancement of the excitatory DMH-Pef projection, the inhibitory DMH-VLPO projection, or both. Citation Information: J Clin Invest. 2017;127(6):2310-2325. https://doi.org/10.1172/JCI91291. Identification and functional validation of oncogenic drivers are essential steps toward advancing cancer precision medicine. Here, we have presented a comprehensive analysis of the somatic genomic landscape of the widely used BRAFV600E- and NRASQ61K-driven mouse models of melanoma. By integrating the data with publically available genomic, epigenomic, and transcriptomic information from human clinical samples, we confirmed the importance of several genes and pathways previously implicated in human melanoma, including the tumor-suppressor genes phosphatase and tensin homolog (PTEN), cyclin dependent kinase inhibitor 2A (CDKN2A), LKB1, and others. Importantly, this approach also identified additional putative melanoma drivers with prognostic and therapeutic relevance. Surprisingly, one of these genes encodes the tyrosine kinase FES. Whereas FES is highly expressed in normal human melanocytes, FES expression is strongly decreased in over 30% of human melanomas. This downregulation correlates with poor overall survival. Correspondingly, engineered deletion of Fes accelerated tumor progression in a BRAFV600E-driven mouse model of melanoma. Together, these data implicate FES as a driver of melanoma progression and demonstrate the potential of cross-species oncogenomic approaches combined with mouse modeling to uncover impactful mutations and oncogenic driver alleles with clinical importance in the treatment of human cancer. Citation Information: J Clin Invest. 2017;127(6):2326-2338. https://doi.org/10.1172/JCI87328. The clinical utility of inhibiting cytochrome P450 17A1 (CYP17), a cytochrome p450 enzyme that is required for the production of androgens, has been exemplified by the approval of abiraterone for the treatment of castration-resistant prostate cancer (CRPC). Recently, however, it has been reported that CYP17 inhibitors can interact directly with the androgen receptor (AR). A phase I study recently reported that seviteronel, a CYP17 lyase–selective inhibitor, ædemonstrated a sustained reduction in prostate-specific antigen in a patient with CRPC, and another study showed seviteronel’s direct effects on AR function. This suggested that seviteronel may have therapeutically relevant activities in addition to its ability to inhibit androgen production. Here, we have demonstrated that CYP17 inhibitors, with the exception of orteronel, can function as competitive AR antagonists. Conformational profiling revealed that the CYP17 inhibitor–bound AR adopted a conformation that resembled the unliganded AR (apo-AR), precluding nuclear localization and DNA binding. Further, we observed that seviteronel and abiraterone inhibited the growth of tumor xenografts expressing the clinically relevant mutation AR-F876L and that this activity could be attributed entirely to competitive AR antagonism. The results of this study suggest that the ability of CYP17 inhibitors to directly antagonize the AR may contribute to their clinical efficacy in CRPC. Citation Information: J Clin Invest. 2017;127(6):2339-2352. https://doi.org/10.1172/JCI92217. Citation Information: J Clin Invest. 2017;127(6):2353-2364. https://doi.org/10.1172/JCI88491. Loss of first-phase insulin secretion is an early sign of developing type 2 diabetes (T2D). Ca2+ entry through voltage-gated L-type Ca2+ channels triggers exocytosis of insulin-containing granules in pancreatic β cells and is required for the postprandial spike in insulin secretion. Using high-resolution microscopy, we have identified a subset of docked insulin granules in human β cells and rat-derived clonal insulin 1 (INS1) cells for which localized Ca2+ influx triggers exocytosis with high probability and minimal latency. This immediately releasable pool (IRP) of granules, identified both structurally and functionally, was absent in β cells from human T2D donors and in INS1 cells cultured in fatty acids that mimic the diabetic state. Upon arrival at the plasma membrane, IRP granules slowly associated with 15 to 20 L-type channels. We determined that recruitment depended on a direct interaction with the synaptic protein Munc13, because expression of the II–III loop of the channel, the C2 domain of Munc13-1, or of Munc13-1 with a mutated C2 domain all disrupted L-type channel clustering at granules and ablated fast exocytosis. Thus, rapid insulin secretion requires Munc13-mediated recruitment of L-type Ca2+ channels in close proximity to insulin granules. Loss of this organization underlies disturbed insulin secretion kinetics in T2D. Citation Information: J Clin Invest. 2017;127(6):2365-2377. https://doi.org/10.1172/JCI88936. Hematopoietic transitions that accompany fetal development, such as erythroid globin chain switching, play important roles in normal physiology and disease development. In the megakaryocyte lineage, human fetal progenitors do not execute the adult morphogenesis program of enlargement, polyploidization, and proplatelet formation. Although these defects decline with gestational stage, they remain sufficiently severe at birth to predispose newborns to thrombocytopenia. These defects may also contribute to inferior platelet recovery after cord blood stem cell transplantation and may underlie inefficient platelet production by megakaryocytes derived from pluripotent stem cells. In this study, comparison of neonatal versus adult human progenitors has identified a blockade in the specialized positive transcription elongation factor b (P-TEFb) activation mechanism that is known to drive adult megakaryocyte morphogenesis. This blockade resulted from neonatal-specific expression of an oncofetal RNA-binding protein, IGF2BP3, which prevented the destabilization of the nuclear RNA 7SK, a process normally associated with adult megakaryocytic P-TEFb activation. Knockdown of IGF2BP3 sufficed to confer both phenotypic and molecular features of adult-type cells on neonatal megakaryocytes. Pharmacologic inhibition of IGF2BP3 expression via bromodomain and extraterminal domain (BET) inhibition also elicited adult features in neonatal megakaryocytes. These results identify IGF2BP3 as a human ontogenic master switch that restricts megakaryocyte development by modulating a lineage-specific P-TEFb activation mechanism, revealing potential strategies toward enhancing platelet production. Citation Information: J Clin Invest. 2017;127(6):2378-2391. https://doi.org/10.1172/JCI88941. Citation Information: J Clin Invest. 2017;127(6):2392-2406. https://doi.org/10.1172/JCI90825. Quiescent and proliferating leukemia cells accumulate highly lethal DNA double-strand breaks that are repaired by 2 major mechanisms: BRCA-dependent homologous recombination and DNA-dependent protein kinase–mediated (DNA-PK–mediated) nonhomologous end-joining, whereas DNA repair pathways mediated by poly(ADP)ribose polymerase 1 (PARP1) serve as backups. Here we have designed a personalized medicine approach called gene expression and mutation analysis (GEMA) to identify BRCA- and DNA-PK–deficient leukemias either directly, using reverse transcription-quantitative PCR, microarrays, and flow cytometry, or indirectly, by the presence of oncogenes such as BCR-ABL1. DNA-PK–deficient quiescent leukemia cells and BRCA/DNA-PK–deficient proliferating leukemia cells were sensitive to PARP1 inhibitors that were administered alone or in combination with current antileukemic drugs. In conclusion, GEMA-guided targeting of PARP1 resulted in dual cellular synthetic lethality in quiescent and proliferating immature leukemia cells, and is thus a potential approach to eradicate leukemia stem and progenitor cells that are responsible for initiation and manifestation of the disease. Further, an analysis of The Cancer Genome Atlas database indicated that this personalized medicine approach could also be applied to treat numerous solid tumors from individual patients. Citation Information: J Clin Invest. 2017;127(6):2407-2417. https://doi.org/10.1172/JCI90896. Genetic variants at the solute carrier family 39 member 8 (SLC39A8) gene locus are associated with the regulation of whole-blood manganese (Mn) and multiple physiological traits. SLC39A8 encodes ZIP8, a divalent metal ion transporter best known for zinc transport. Here, we hypothesized that ZIP8 regulates Mn homeostasis and Mn-dependent enzymes to influence metabolism. We generated Slc39a8-inducible global-knockout (ZIP8-iKO) and liver-specific–knockout (ZIP8-LSKO) mice and observed markedly decreased Mn levels in multiple organs and whole blood of both mouse models. By contrast, liver-specific overexpression of human ZIP8 (adeno-associated virus–ZIP8 [AAV-ZIP8]) resulted in increased tissue and whole blood Mn levels. ZIP8 expression was localized to the hepatocyte canalicular membrane, and bile Mn levels were increased in ZIP8-LSKO and decreased in AAV-ZIP8 mice. ZIP8-LSKO mice also displayed decreased liver and kidney activity of the Mn-dependent enzyme arginase. Both ZIP8-iKO and ZIP8-LSKO mice had defective protein N-glycosylation, and humans homozygous for the minor allele at the lead SLC39A8 variant showed hypogalactosylation, consistent with decreased activity of another Mn-dependent enzyme, β-1,4-galactosyltransferase. In summary, hepatic ZIP8 reclaims Mn from bile and regulates whole-body Mn homeostasis, thereby modulating the activity of Mn-dependent enzymes. This work provides a mechanistic basis for the association of SLC39A8 with whole-blood Mn, potentially linking SLC39A8 variants with other physiological traits. Citation Information: J Clin Invest. 2017;127(6):2418-2432. https://doi.org/10.1172/JCI91445. Glucocorticoid steroids such as prednisone are prescribed for chronic muscle conditions such as Duchenne muscular dystrophy, where their use is associated with prolonged ambulation. The positive effects of chronic steroid treatment in muscular dystrophy are paradoxical because these steroids are also known to trigger muscle atrophy. Chronic steroid use usually involves once-daily dosing, although weekly dosing in children has been suggested for its reduced side effects on behavior. In this work, we tested steroid dosing in mice and found that a single pulse of glucocorticoid steroids improved sarcolemmal repair through increased expression of annexins A1 and A6, which mediate myofiber repair. This increased expression was dependent on glucocorticoid response elements upstream of annexins and was reinforced by the expression of forkhead box O1 (FOXO1). We compared weekly versus daily steroid treatment in mouse models of acute muscle injury and in muscular dystrophy and determined that both regimens provided comparable benefits in terms of annexin gene expression and muscle repair. However, daily dosing activated atrophic pathways, including F-box protein 32 (Fbxo32), which encodes atrogin-1. Conversely, weekly steroid treatment in mdx mice improved muscle function and histopathology and concomitantly induced the ergogenic transcription factor Krüppel-like factor 15 (Klf15) while decreasing Fbxo32. These findings suggest that intermittent, rather than daily, glucocorticoid steroid regimen promotes sarcolemmal repair and muscle recovery from injury while limiting atrophic remodeling. Citation Information: J Clin Invest. 2017;127(6):2433-2437. https://doi.org/10.1172/JCI92030. Citation Information: J Clin Invest. 2017;127(6):2438-2438. https://doi.org/10.1172/JCI94890. Citation Information: J Clin Invest. 2017;127(6):2438-2438. https://doi.org/10.1172/JCI95182.